Denise Covey: Insecure Writers Support Group Post - What's your writing routine? Are you 'over' blogging? Insecure Writers Support Group Post - What's your writing routine? Are you 'over' blogging? I'm not actually feeling insecure this week, but I'm feeling somewhat overwhelmed. You know how it is, too much to do, too little time. So maybe I'm insecure in prioritizing. How about you? Is this a strength for you or a weakness? Some writers work on one project at a time, keep at it until it's finished, submitted and accepted for publication, then move on to their next project. Does that sound like you? I, along with many of you, I suspect, work on projects as the spirit move me - from flash fiction pieces for the WEP monthly bloghop (which is turning into a novella set in Paris), short stories for competitions and magazines, and working on one particular novel that requires a re-write in many areas before submission. while other short stories and novels languish on my hard drive. Wouldn't it be nice if we had the whole day to write? That happens very occasionally to me, but my daily routine includes teaching English for 20+ hours a week, plus prep. time, critiquing for my online critique group, occasional critiquing for writer's group members, reviewing books, attending book launches for friends who actually finish a book and publish it, not to mention the usual domestics. Then there's social media, which as we all know, takes shameful amounts of time away from everything else if we don't control it. Lately I've been seeing blog posts about bloggers who are 'over' blogging in favour of facebook, twitter, tumblr, Google+ etc, all of which take less time than the drain of creating blog posts, the demands of visiting other blogs (if you want people to visit you, some of whom will actually read your posts) and an over all disenchantment with something that used to delight them. I don't know about you, but I still find blogging the most satisfying of the social media, but its time commitment is a worry. Facebook, twitter etc don't require much commitment, just a quick in and out to show you're still alive and cooking. Do you feel secure about your writing life/schedule? Do you have social media sorted so that it enhances your writing rather than interferes with it? Are you 'over' blogging in favour of other less-demanding social media? Go here to find other posts for IWSG. Before I go, one thing I'm not insecure about is creating a writing space for those bloggers who like writing prompts. 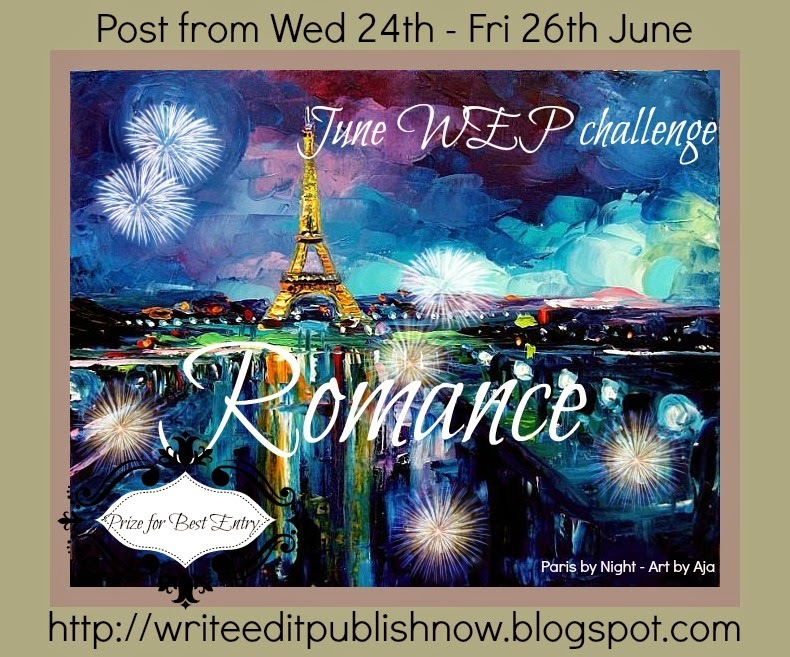 Write...Edit...Publish has a ROMANCE prompt for June, acknowledged as the most romantic month of the year as it's when most brides marry (in Australia, it's September - the beginning of Spring). So why is Geo's and my wedding anniversary tomorrow, June 5?? For the WEP prompt, you can deal with romance however you wish - it doesn't have to be wine, chocolate and roses (but that is a nice thought) - it could be a photo essay set in romantic spots close to home or abroad - it could be a tale of romance gone cold - it could be an extra-terrestial romance. Any ideas? I would love it if you posted to the prompt. I am offering a prize of a $10 Amazon Gift Card to the entry I consider the most creative use of the prompt. If I am overwhelmed with entries, I will offer a second prize of a $5 Amazon Gift Card. 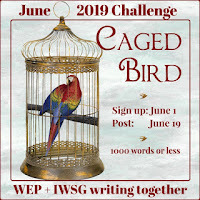 Details for submitting at are Write...Edit...Publish, but basically you just add your link to the Submit List which will be posted in early June. Lord goodness I could never imagine choosing social media over blogging. That's why I gave up Facebook! I don't want to ever be "over" blogging - after all that's how I met my fiancee!! Ah, gr8 story! Blogging forever for you ! My writing is always chaotic. I didn't write much over May but I did manage to edit 8 chapters, so that was good. I'm trying to do as much as I can: writing, editing and reading. It's a challenge though. I still like blogging. I don't post quite as often and it's difficult to keep up but I enjoy doing it even though I rarely get comments. If anything, I'm probably less into Twitter. I don't post on it much and I only use facebook to keep up with family cause like my grandma is on facebook and such. And I didn't really get into any other places, though I do have pinterest now, but that is mostly so i can look at pretty cakes. Gr8 to hear from you Dawn. I'll be over soon. No, blogging will always be my first choice. It's where I began and where I will end. 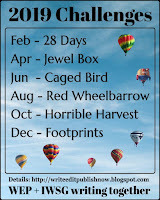 But it can take over (like during April's A to Z Challenge, which I always plan for) so the key is finding a balance and a schedule you can live with. 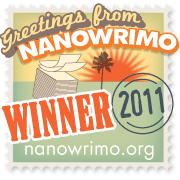 I'm working on a manuscript right now, so just one day a week posting for me right now. I saw elsewhere that you finished your ms Alex. Congratulations. I would give up other forms of social media before blogging, but I have cut back. Yes, Donna, don't we all or we'll go crazy. Blogging is it for me, so I keep two blogs. I prefer it, and I don't try to keep to a daily schedule as some do. Slower blogging can be the answer. Glad to see the new challenges for WEP, Denise! 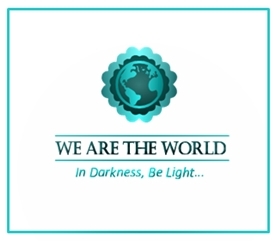 I added a WEP tab to the top of my blog pages. Happy Anniversary! Slow blogging, like slow food, suits me! Blogging beats all the other crap for me. Yeah facebook and twitter are faster, but who wants to hear you just went to the loo? All that is said on there is 90% crap, sometimes literally lol but I suppose it is better to read 140 character tweet on it than a 500 word blog post. As always, succinctly said Pat. Sunday I worked 11 hours straight and drove 400 miles as a rare blood courier -- so finding any time to write my current novel is a labor of Hercules! Daily blogging is how I keep my friends interested in my prose and my take on the world. In cyberLand, you are quickly forgotten. The next cancer surgery will take even more time from me. Cross your fingers for me! I wish you every good wish for your surgery Roland. You don't really have to blog every day. We don't forget that easily! Blogging is a big time commitment. It's why I've cut back the amount of posts I write (this week is not the norm). It's all about finding the right balance that works for you. I prefer to work on one project at a time, but occasionally I'll branch out and write a short story or develop an idea for another novel. I get more out of blogging than the twittering that goes on on FB and, well, twitter. I'm really not interested in what anyone has for tea, but blogs give people time to explore ideas. But - while blogs are more satisfying, the other stuff feels necessary these days if our blogging efforts are not going to sink without trace. Oh heck!! Oh heck alright! Am motoring through Over the Hill and loving it. I still love my blog, but I don't post as much as I used to. I don't have a schedule for writing or blogging, though, so I've got nothing to try to adhere to. I really wish I had a better writing schedule though, I might achieve more! No one seems to post as often as they used to, but that's not necessarily a bad thing. Yes, I get overwhelmed often. My life is full of commitments, it's hard to make time for myself, but I'll get there. Writing is too important to me not to make time for it. I do miss my blogging very much. Miss your blogging too, Miranda. You and me both. Happy writing ! I don't think people are over blogging, but I do think that blogging as a whole is evolving and maturing from those early days of giddy exuberance. Oddly enough, I woke up this morning noodling on a possible blog post about exactly that subject! I'm very much a one-project-a-time person, and with all the things that need to happen after those misleading little words "the end", I spend very little time actually writing. I have to admire people who can keep on writing new content here there and everywhere alongside everything else going on. We all work in different ways, don't we? Blogging is the only form of social media that I truly enjoy. Try as I might I simply can't ever get comfortable with the others. But blogging is very time consuming and I'm struggling with coming up with posts to write about. I'm cutting back on my blogging for now in the hopes that the energy I had for it in the past will return. The time blogging takes is the killer. Of all the social media I do, blogging is by far the most interesting and rewarding. On these Wednesdays, I love visiting as many blogs as possible. As far as writing is concerned, I love having a lot of projects going at the same time. Great to find your blog today. I'll be back. Yes, IWSG is a perfect opportunity to visit bloggers. I never get around to everyone, I think that would be impossible! I'm feeling so overwhelmed too! I wish I had a day to write. I'm hoping for some time this summer. It's good to recognize it, so hopefully you can relieve the stress. You must be so busy with Vine Leaves too Theresa! I schedule my blog posts and also schedule posts to go up on Facebook. I find it helps to eliminate a lot of stress. You may have to plan ahead on FB statues as to what you would want to share, but that bit of planning will let you relax longer, and give you time to do other things. Good luck! I can't imagine pre-scheduling FB, but obviously it is possible Chrys! 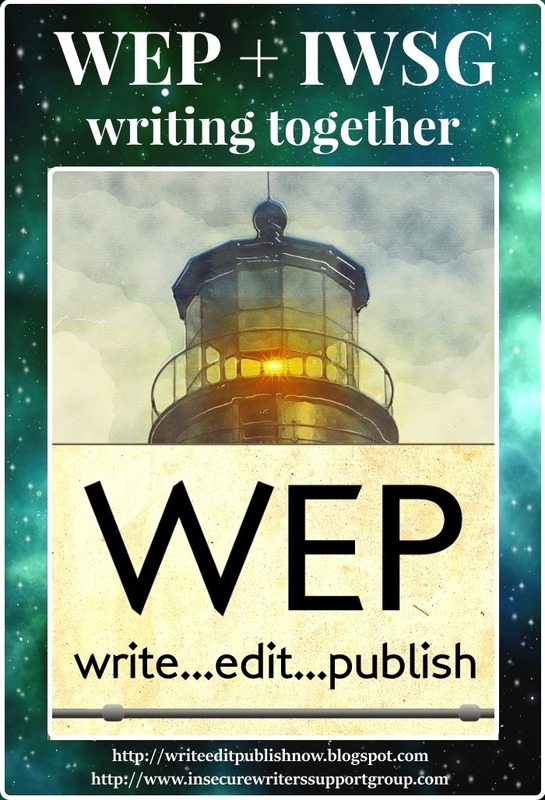 I've been meaning to take part in WEP again for ages now, but then I run out of time. Romance sounds like a good prompt, I'll try to get something written for it! I don't find blogging to be losing its charm at all - I'd much prefer to blog than go on twitter or facebook. It just seems more personal to me, returning comments and visiting blogs etc. Laura, your previous WEP entries were great. I hope you can find something for this month. Those of us who love blogging above all else really appreciate the worth of fellow bloggers. It's had its ups and downs in the 9 years I've been blogging, but I still enjoy it. It feels more personal. Yes, I still enjoy it far more than other social media. Social media is a necessary evil...but alas we need it! I still like blogging best but I'm trying to be more of a presence other places too. It is too much time to keep up. I wish I had the luxury of working on one project at a time, but if I did that I wouldn't get anything done. I think I need a better schedule. I love flitting between projects. I obviously have a short attention span. As for social media. BLOGGING is for me. I know it takes time, but to me I need to have have my personal time with my blogger buddies. Since I have very few friends here in Chicago, the blogosphere is my social outlet as well. I have REAL friends who care about me and it's important to keep the lines of communication between them and myself open. Hi Michael. Have emailed you! Personally, more into blogging than FB, without question. Prioritising is always a problem - stuff has a habit of getting in the way of writing. A lot of people have tossed blogging aside in favor of social media, but they have very different uses. I divide my online time between my blog, Facebook, and Twitter, and it's funny--there are different audiences for each. It might mean cross-posting something if I have something to promote, but that also means it reaches more people. I wouldn't give up the great blogging community for anything! I wish I had a whole day to write! But then, I'd probably procrastinate all day and squander it *sighs* Maybe I am stifled on writing because I have so many projects going on. If I just write on one to its completion, at least something will be completed. Yep, just finishing something is quite a feat. Always. That's actually what my IWSG post was about. No. In fact I'm focusing on my writing and sidelining almost all social media. Just have so much time in the day, after all. I actually did have to sit back and take stock lately, because blogging became incredibly draining when I was going through tough times. In the end I withdrew from all social media. But you know what? I find all other social networks to be impersonal, so blogging is the one I returned to instead of any of the others. Blogging is winning hands down it appears. It's such a balance that can be tough to maintain. Thankfully, I have no set schedule and have never been insecure about my writing. Then again, I've never been serious about writing. Just shared therapy. Ah, you have a relaxed attitude Gary. Good for you. Blogging remains my favorite form of online interaction, but I've cut back to only posting once a week. The other stuff I barely toy with. Although I don't spend as much time working on my next novel as I probably should if I ever expect it to be published in this lifetime, I don't beat myself up about it too much. If my hubby wants me to go out with him... even if it's only to the hardware store... I go. I reckon that makes him my top priority. I haven't written a thing since we moved, I've been so tired. But I've started on a series of flash fiction faerie stories and og course I'm still working on the sequel to Treasures. You sound overwhelmingly busy. Not overwhelmingly, Nancy, but a bit too busy. Most is enjoyable though, just getting the time is the thing. I'm still trying to find a balance between the different types of social media. I began with Facebook in February, then blogging in March, so I'm still a relative newbie. Fitting in the social stuff and finding time to write in between everything else that goes on in life has been a challenge. At the moment I have three writing projects going -- my first book which I'm getting ready to self-publish; my second book, a sequel to the first, in the revising stage; and a third, unrelated book that I'm about two-thirds of the way through. Right now, the second two are on the backburner until I get the first one out. I feel overwhelmed often, but I'm working on it. I find a prioritized to-do list helps me immensely. Good luck with all your projects and thanks for visiting my blog! I wish you the best with all your projects Lori. Oh, and I plan on re-joining the Write...Edit...Publish bloghop! I've missed it :) Looking forward to June! This post is great Denise! I'm juggling time like mad here! What a loss to us all if you weren't on the blogs, Hilary. I can't imagine giving up blogging. It is time-consuming, but I've benefited so much from it. I have seen bloggers go off the radar and I miss their blog presence. I don't have much of a routine. When I'm working, it's usually nights, but mostly weekends. When I have time off, it's every day.